The main entrance to the park is in Wokingham Road. From the East: Follow A4 or M4/ A329M. From the A329M Suttons roundabout take the A4 London Road towards Reading. Take 1st left, St Bartholomew’s Road. Turn left into Wokingham Road. Turn left into the Stadium and park here. ( NOTE Please ignore SATNAV instructions to continue past the park entrance.) 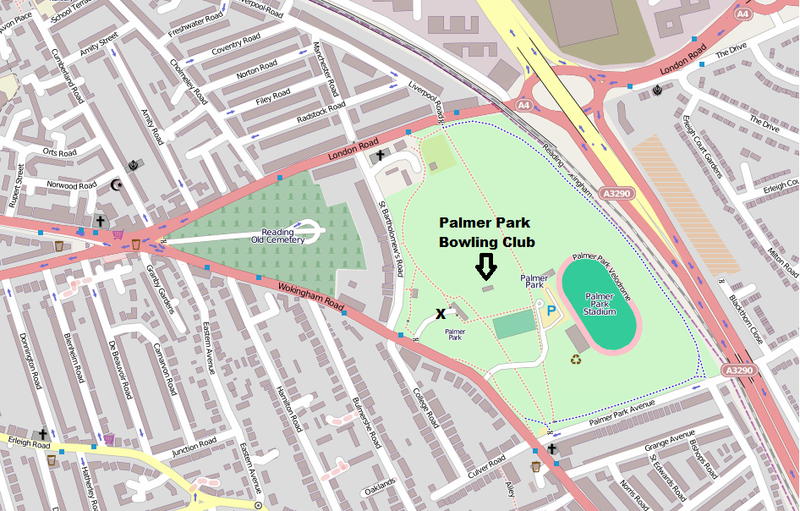 Access to the Bowls Club is along the path from the ‘Lord Palmer’ statue on the right hand side. From the North: Caversham or Reading bridges over the Thames lead to Queen’s Road. At Cemetery Junction follow Wokingham Road. Note that the centre of Reading can get congested and then the alternative of crossing the Thames at Sonning is recommended. Follow A4 as above. From the South and West : Leave M4 at junction 12 and follow A329M as above.